TITANS OF SERVICE combines theory with practical insights, examples and references from experts. Bringing together 14 service experts, this book offers the most up-to-date academic knowledge from the service field in the U.S., Europe and Asia, including Prof. Rajendra Srivastava from Singapore Management University who calls for disruptive service innovations. In addition to offering theoretical insights, practical guidance and examples, this book also gives an overview of the current and future role of services. Titans of Service provides a framework for thinking about ways in which new knowledge on services is integrated with high profit and growth. The Titans of Branding reflects innovative strategic thinking in the field of global branding. It is a unique presentation of the views of nine renowned experts. The Titans of Branding will equip you with the academic and managerial strength to succesfully face the future challenges of branding in our global economy. 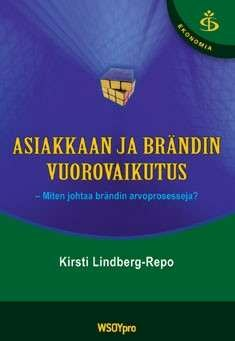 Asiakkaan ja brändin vuorovaikutus - miten johtaa brändin arvoprosessejA?